After seed is placed in the ground, the yield potential of a crop is often determined by water availability. If it’s too dry, a grower may decide against top-dressing fertilizer or applying a fungicide. In other cases, there might be more soil moisture available to the plants than recent weather or a rain gauge would suggest — so an in-crop application might still be justified. With advancements and adoption of soil moisture sensors over the last few years, a farm equipment dealership in southwest Saskatchewan has developed an app to interpret data from soil probes to make real-time crop management decisions. 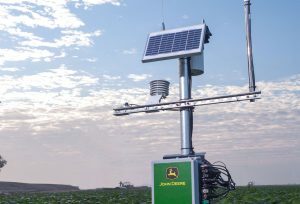 The Crop Intelligence program is based on data collected via John Deere’s Field Connect weather stations. In addition to agronomy decisions, the app’s information on yield potential could possibly be used to inform a grain marketing plan. While soil sensor technology has moved forward in the last decade, Hutchison says the improvements in communications technology — data connectivity — will be important for taking the next step in real-time field monitoring.